Welcome to That's Empressive Gallery and Gift Emporium...a one stop shopping opportunity deep in the Canadian Badlands. We're the last store standing in the little village of Empress, Alberta . 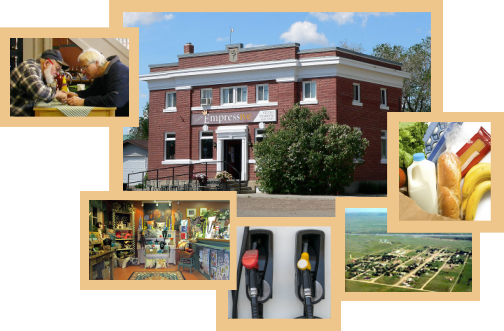 . . an art gallery, restaurant, gas station and grocery store all under one roof. 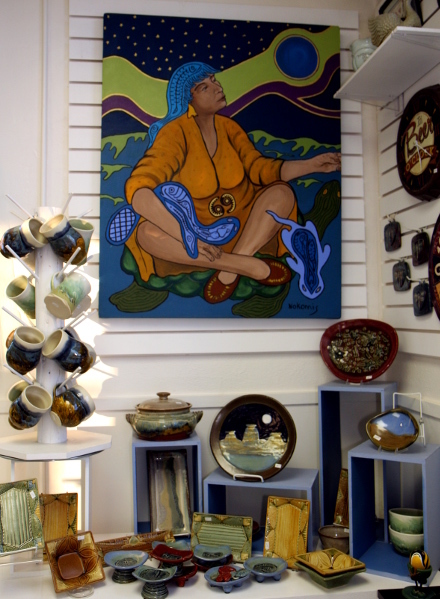 Gallery, gifts, gas and groceries . . . who knew? We're in cowboy country miles from anywhere, but you can buy toys to keep the kids quiet in the car, handmade ceramic mugs and bowls, spectacular women's costume jewelry, unusual home decor and other truly unique and creative gifts. We also have a huge selection of limited edition First Nations' prints, note cards, even pricey original art because the Ojibwa artist Nokomis makes this village her home base. From the photograph above you probably figured out that my store and cafe are housed in an old bank building...and you're right. The structure is no longer a money laundering institution, but because the vault is still in working order I've continued the tradition of providing a safe haven for customer's hard earned dollars. So drop in when you're in the neighbourhood and make a deposit. Just keep in mind that I don't do withdrawals. The coffee is always on, the tea kettle is on the boil and there's usually a steady stream of friendly town folk who will be happy to sit down with visitors to make their acquaintance and ask nosy, personal questions. The doors open at six in the morning and despite our remote location...12 kilometres off the nearest secondary highway...travelers find us. Sometimes because they're just desperate for gas. But many, many times people have driven out of their way on the strength of word of mouth advertising. Places to Go, People to Meet if you visit our village.